and details from original call for action are here. Keep Space for Peace Week is not forgotten in Jeju Island. 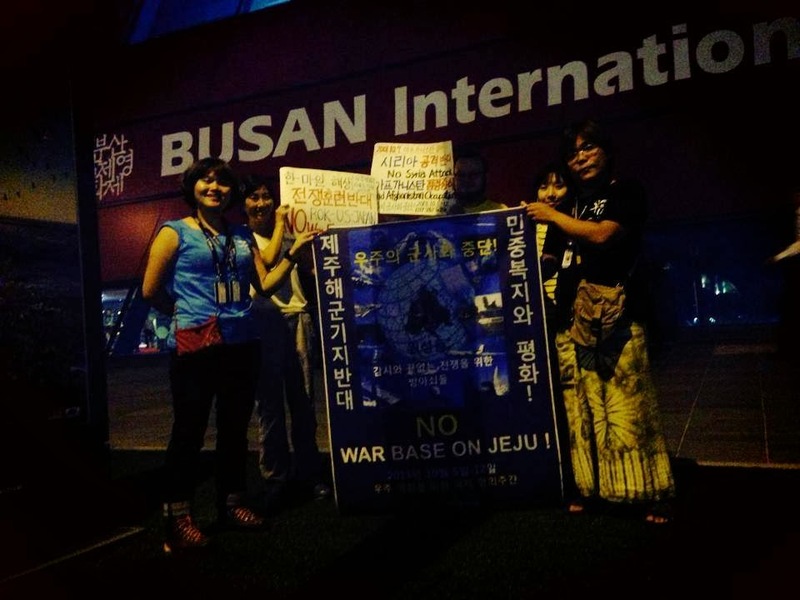 The Korean words in the banner read: "No Naval Base on Jeju" and "People's welfare and peace." The signs held by Paco Booyah and me read "No Syria Attack, End the Occupation in Afghanistan" and "No ROK-US-Japan" war exercise. Oct 7 was the 12th remembrance year of the US invasion to Afghanistan. The US-ROK-Japan are holding war exercise in the southern water of Korea. The original date was from Oct 8 to 10 (the date was to be postponed because of weather) while the nuclear aircraft carrier George Washington was mooring in the Busan port from Oct 4 to 7. Photo by Cho Sung-Bong, director of the Jeju documentary, "Gureombi, the Wind is Blowing" in the Busan film festival. 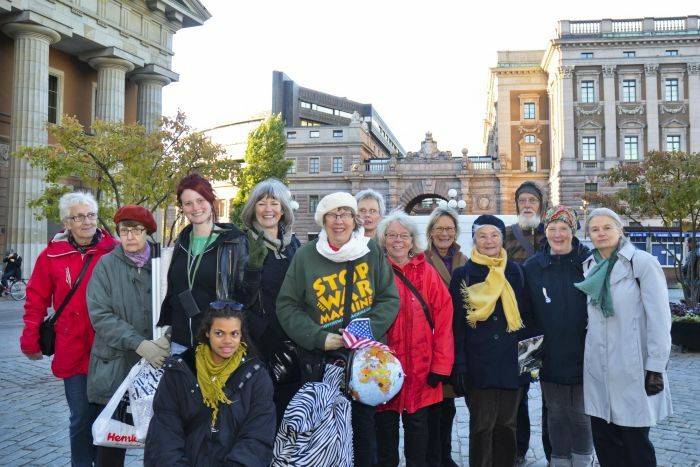 Women for Peace organized a vigil in front of the Swedish Parliament Building with banners that read "Drones kill". Global Network board member Agneta Norberg is featured in the picture above. 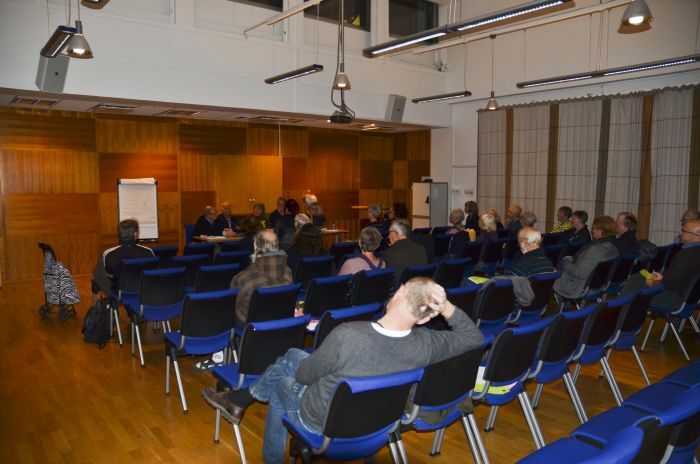 In the evening they organized a panel discussion on space issues with Swedish parliamentarians. 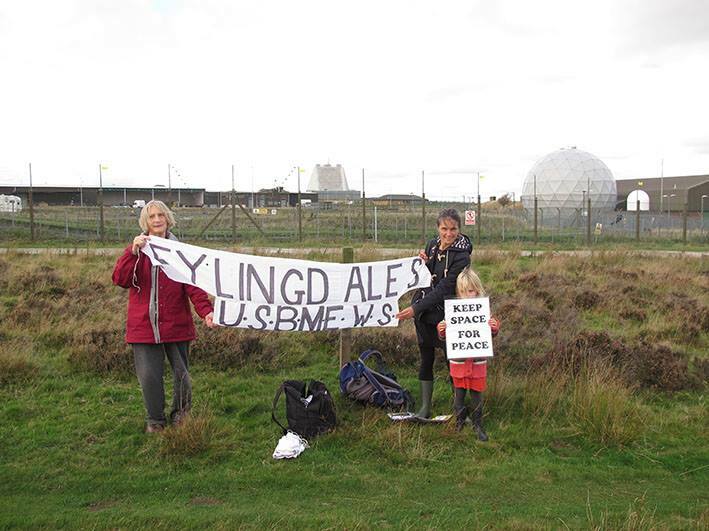 A small group of us enjoyed the sun at Fylingdales Early Warning Station on the North York Moors on Saturday, as part of the Keep Space for Peace Week. 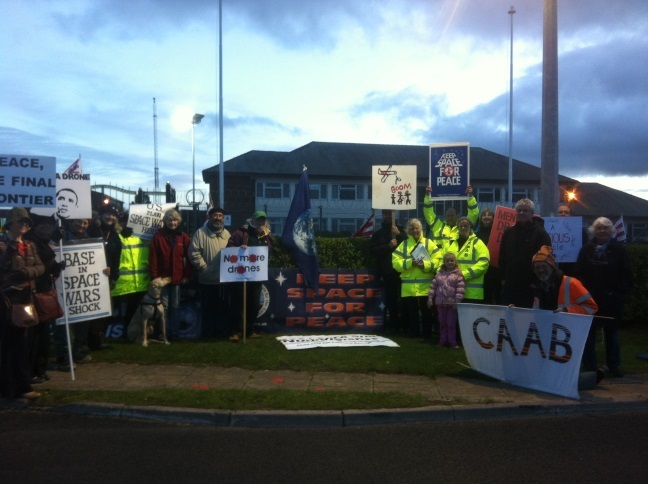 It got colder and colder at NSA Menwith Hill last night as about 25 people gathered at the gates of the base to protest at the role this base plays in Drones in particular and the US Missile Defense system. How there was no rain! 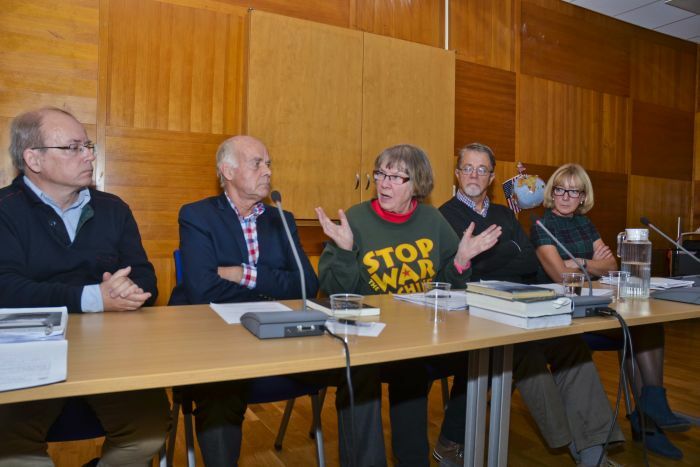 We were one action of 46 actions round the world by groups and individuals world in answer to the call by the Global Network Against Weapons and Nuclear Power in Space for a week of international protest against the militarization of space – RETURN SPACE TO PEACE. 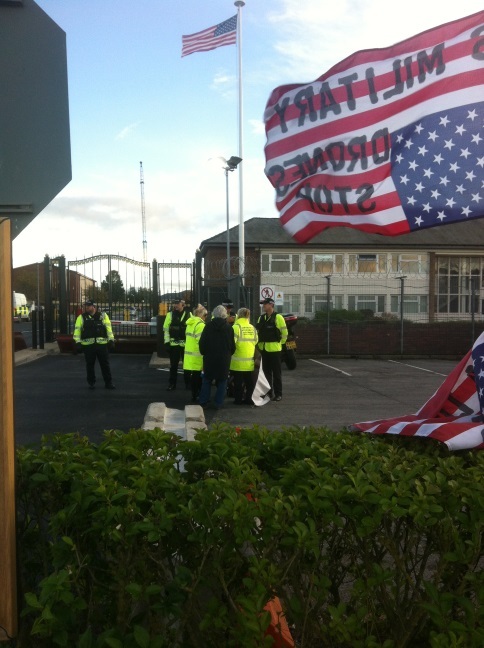 We had previously written to Christopher Gilmore (US Commander in control and occupation of the base) asking him if he would come and join us so that we could give him a letter setting out our concerns. Christopher Gilmore declined our invitation so Geoff Dickson (RAF Liaison officer at NSA Menwith Hill) agreed to joined us to receive a letter for us. 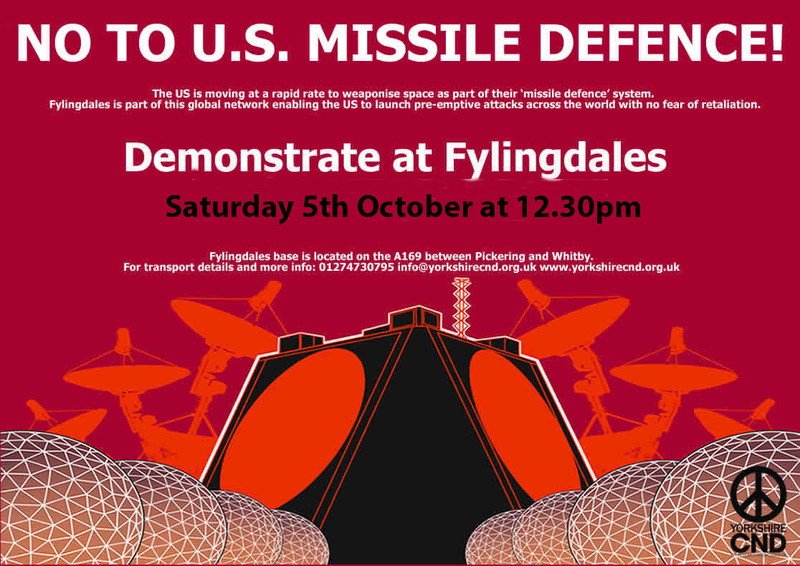 Even though this was a small demonstration in the scheme of things, there were people from Canada, the US, Italy, Pendle in Lancashire, Leeds, Colne, Otley, Bradford, Pickering, Bedale and Harrogate! 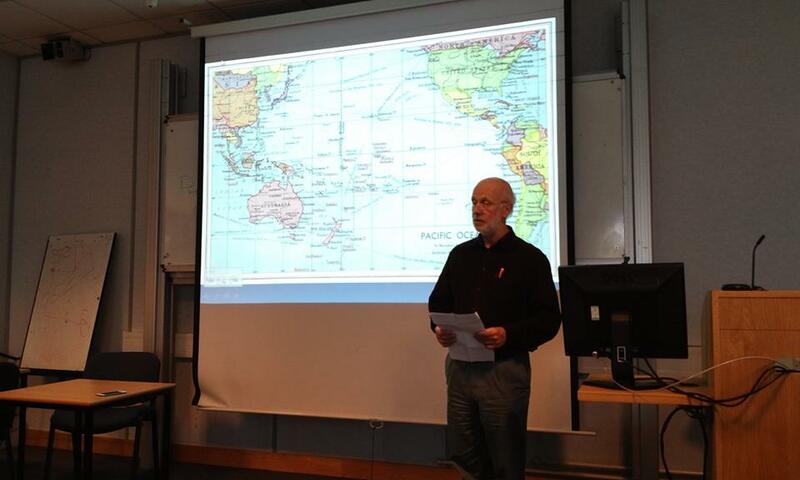 what he does and privileged to hear him speak candidly about his thoughts and experiences. We were disappointed that the Ministry of Defence police were again somewhat aggressive in their policing and attitude to those who crossed the illegal and contentious ‘yellow line’ which they say denotes the boundary of NSA Menwith Hill and which North Yorkshire Police say is ‘only an indication of the boundary’. We will, once again be pursuing this with North Yorkshire police as the MDP police on behalf of NYP. The demonstration ended just before 8 pm when we stood in the dark, calm night for two minutes silence to remember all the thousand of people who have been killed or injured by Drones. We especially thought about the civilian people caught up in this frightening, illegal and immoral relatively new military weapon. Thank you so much for every one who came. 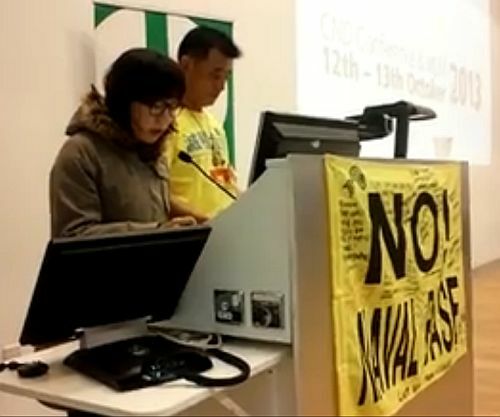 To Brian Terrell, Martin Schweiger who spoke on behalf of CAAB, Brigid-Mary for pursuing the ‘right to protest’, Christine Dean who managed the CAAB stall and especially to the ‘hot, delicious soup and rolls’ team – provided by Laila and Rob Packer (not forgetting Fia!). It was extremely welcome! 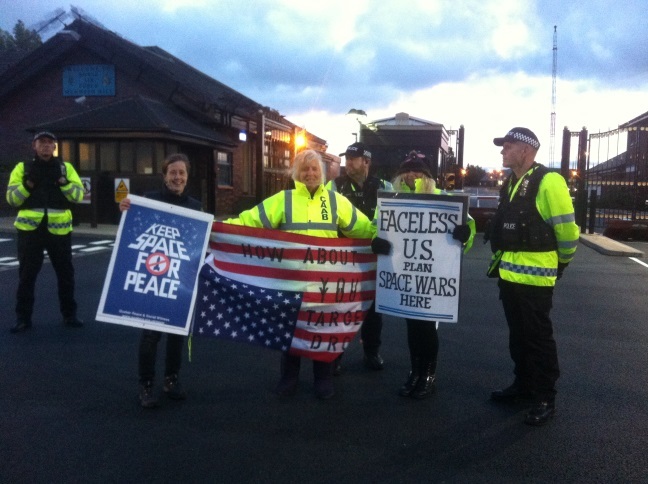 I had the great privilege of protesting tonight with incredibly dedicated British peace activists outside the US-RAF Menwith Hill base that is used for American missile defence and US NSA-UK GCHQ spying around the world. It is headed by an American commander. See the American flag flying on the base? This large military base is situated in the beautiful Yorkshire dales and is a terrible blight on this rural landscape. The people have been protesting to close it down for three decades. 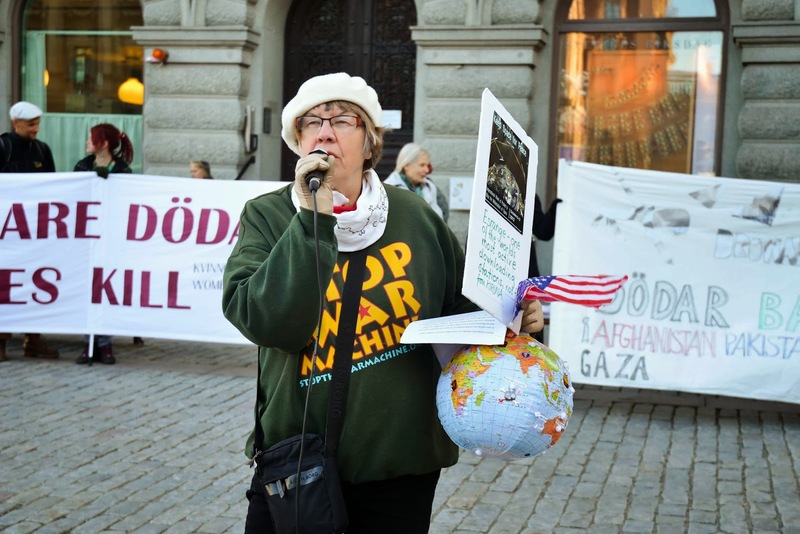 Grandmother Lindis Percy (GN board member) co-founded the Campaign for the Accountability of American Bases and has been protesting every week for 12-years straight. 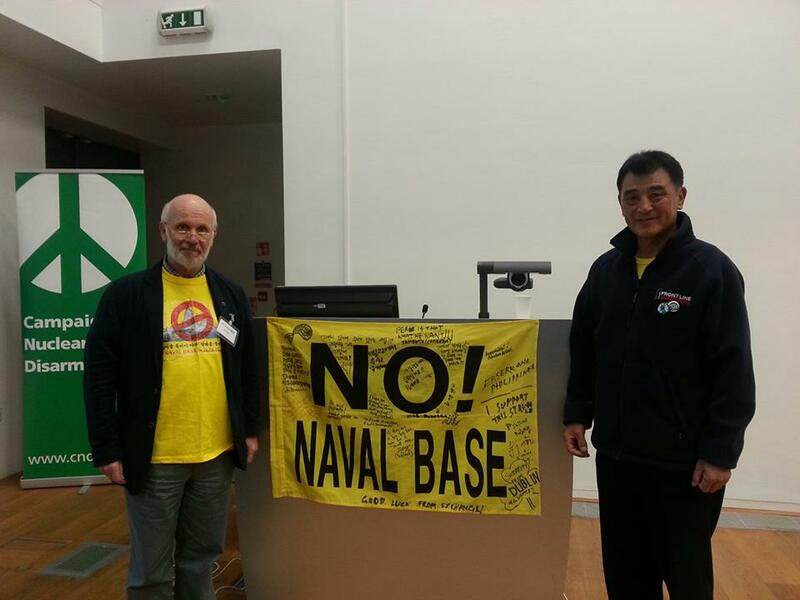 We were standing with our flags and banners in solidarity with our friends in the Global Network Against Nuclear Power and Weapons in Space. 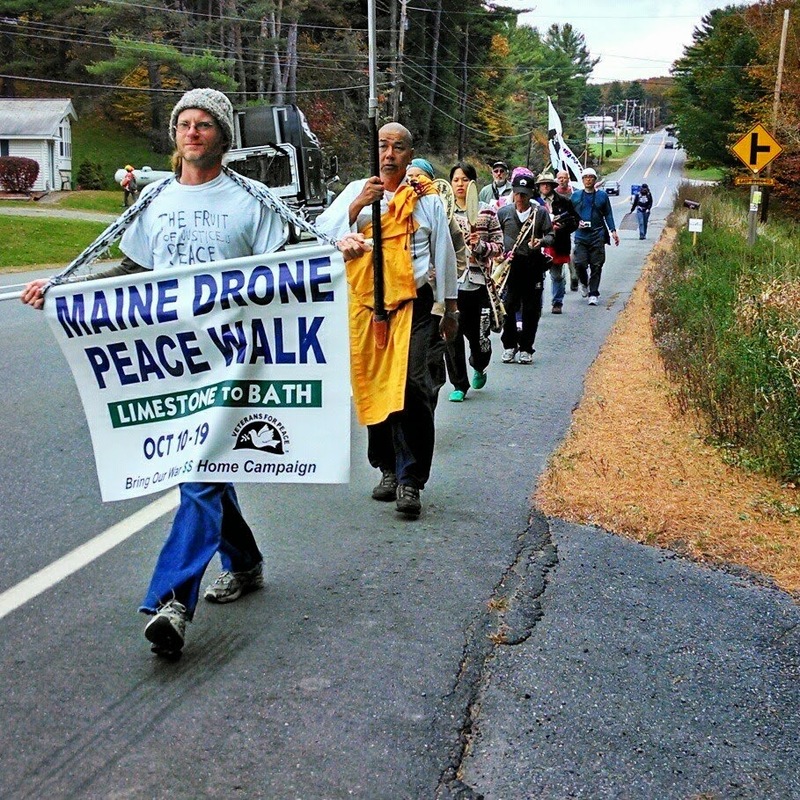 Peace walk led by Jun-san Yasuda from Limestone to Augusta, Maine called Preserve our Privacy: No Drone Spying in Maine. Citizens for Peace in Space and the ACLU sponsored, as part of International "Keep Space for Peace" week, a forum at Penrose Library called "From Drones to Phones high tech warriors break the law" on Tuesday October 8, 2013. On Friday October 11, they held a vigil outside Schriever AFB, the home of the Space Warfare Center and think tank for current and future high tech war planning and execution. 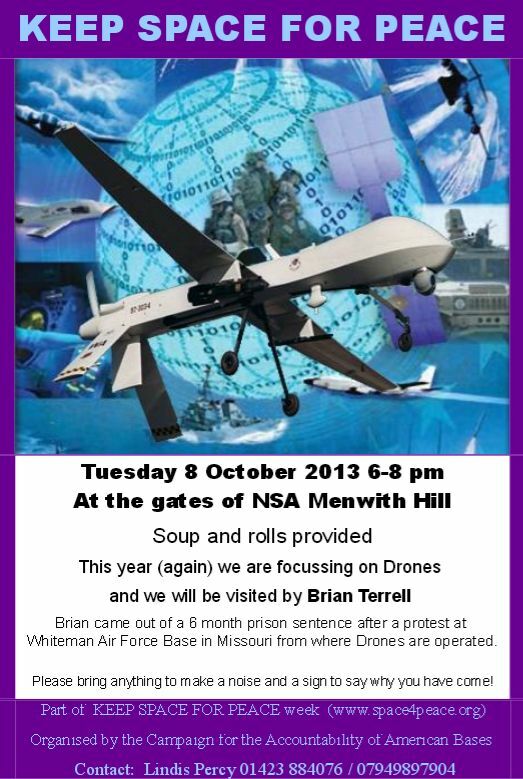 On Saturday October 12 they held a vigil at Minuteman III nuclear missile silo N-8 in Weld County Colorado. N-8 is one of 49 such sites in Colorado on 24/7 alert. They joined groups from Denver. US lethal drone strikes in countries like Pakistan have brought up serious questions about the legal and political implications of using these systems. Fault Lines looks at how these new weapons of choice are allowing the US to stretch the international laws of war and what it could mean when more and more autonomy is developed for these lethal machines. This is part 1 of "From Drones to Phones high tech warriors break the law" in which Loring Wirbel explains the budgets and technology involved. This is part 2 in which Bill Sulzman speaks of the moral implications of the militarization of space and our society. Also both Bill and Loring answer questions and offer more information. "The U.S. intelligence gathering apparatus now includes civilians throughout the world as potential enemies. Everyone is considered a possible obstacle to having the most efficient "kill chain" possible." Jeju Island is a beautiful subtropical island, 60 miles south of the Korean Peninsula, it is home to 3 UNESCO World Heritage sites, and biosphere reserves. On the southern shoreline at a small fishing village called Gangjeong, the South Korean government (with strong 'encouragement' from the US) is building a huge navy base. The base is destroying a wonderful conservation area, made of soft coral and harbouring many rare endangered species, and the homes and livelihoods of two thousand subsistence farmers and divers. The area called Gureombi is a site sacred to the villagers - a living, breathing landscape of tide pools, lava rock formations and stunning volcanic coastline irrigated with crystal clear springs, the precious mineral kidneys of the island. 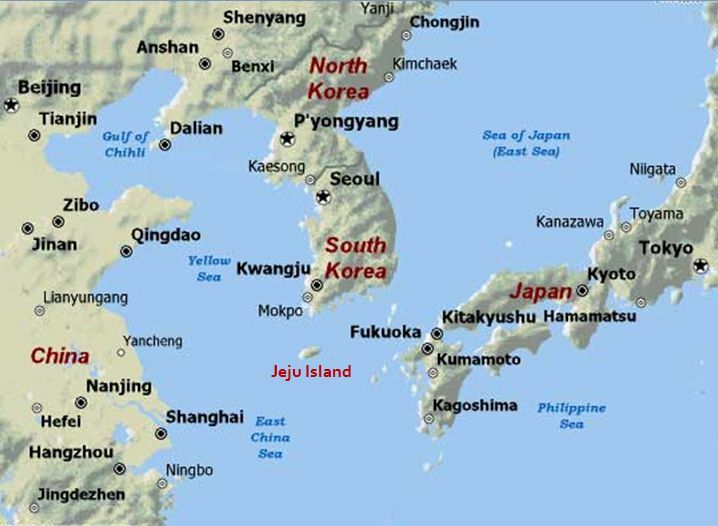 Unfortunately, the Jeju base is also one of the centerpieces of Obama’s militaristic Pivot to Asia. Within a thousand miles—45 minutes by jet bomber, or 120 seconds as the missile flies–of Shanghai, Beijing, Tokyo, Taiwan, Vladivostok, it menaces all the major cities of East Asia. 94% of the villagers are adamantly opposed to the construction. 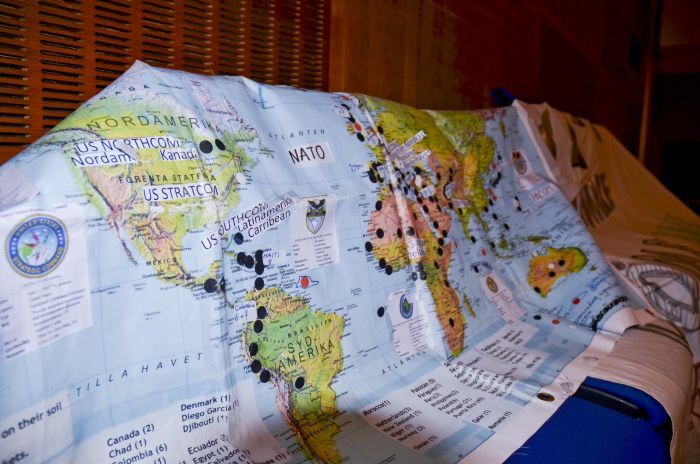 140 National organizations, and 110 international organizations have called for its cessation. The Korean Parliament has demanded an investigation. The leaders of all the major religions in Korea have called for dialogue. The 5 opposition parties have challenged the legality of the construction, yet it has gone ahead, violating, subverting or ignoring every democratic process, every local, regional, national, international statute, charter and law. In attempts to save their village from the military base, 700 protestors have been arrested—including the largest mass arrest of Catholic Nuns in Korean History. Prominent intellectuals, civic and religious leaders, members of parliament, Buddhist nuns, and the Mayor of the village have all been “dragged like animals and beaten unconscious”, arrested, fined, sued, harassed by police, marines, and hired thugs; and received death threats. They have also been branded as Communists, opening them up to potential prosecution for Sedition under the draconian national security laws. Mr. Kang Dong-Kyun, a tangerine farmer, was elected Mayor of Gangjeong on August 20, 2007. Since being elected, Mayor Kang has thoroughly devoted himself to save the village from building of naval base, at the risk of his own health, his own family’s livelihood and his own freedom. That is why he is a beloved and respected figure by most villagers. On August 28, 2011 he signed the Mayors for Peace membership registration-form while in police custody.